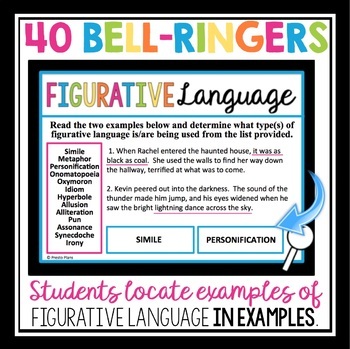 Engage your students as soon as they walk in the room with these figurative language weekly bell ringers that will last you the entire school year! The bell-ringers allow students to determine what figurative language is used in examples (2 per slide). 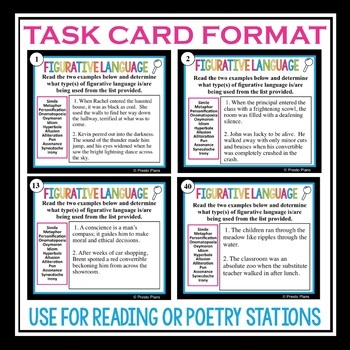 The resource also includes a student booklet and task-card format, so they can easily be used in a reading station. The types of figurative language included in this resource are simile, metaphor, personification, onomatopoeia, oxymoron, idiom, hyperbole, allusion, alliteration, pun, assonance, synecdoche, and irony. • A 40 slide Powerpoint presentation. Each slide has two examples using one or more types of figurative language. Once students have determined what types are used, simply click to reveal the answers! • Each of the 40 slides are also in task card format for easy use in a center in your classroom. 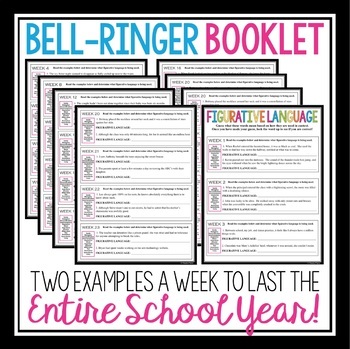 • A ready-to-print booklet (organized by week) so students can keep it in their binder to complete them as bell-ringers. 1. 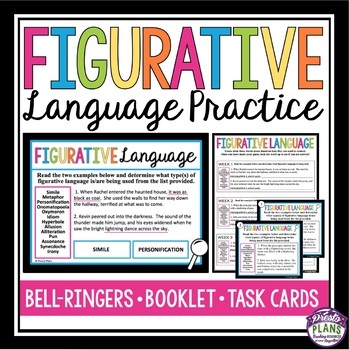 Friday Figurative Language: Pass out the bell-ringer booklet version to your students at the start of the year. Introduce one of the slides to your class per week for 40 weeks as bell-ringers. Everyone determines what figurative language is used, click to see the answers. 2. Writing Center: Include a packet of the task cards at a center where students can choose which ones to work on. The work can be done on the task card or using the work booklet. Print out 6 slides per page on Powerpoint (option provided when you print) and keep a definition booklet for students to check their answers. 3. Pair Work: Give each pair of students a task card and have them complete it together. Then, each pair can present the sentences to the class.